Take advantage of this charming cuff bracelet! This piece of jewelry is hand made out of genuine sterling silver and Multicolor inlay. The inlay consists of: real Turquoise, Tiger Eye, Picture Rock, and Black Jade. 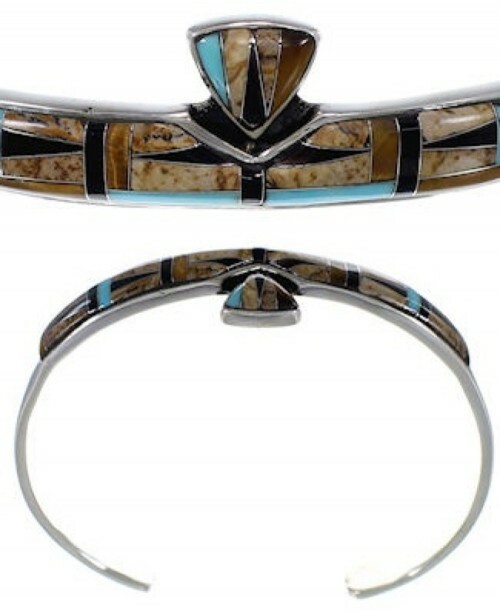 The inlay is delicately set, while placed on top of a shiny silver cuff that is absolutely stunning. The bracelet is stamped sterling and hallmarked.